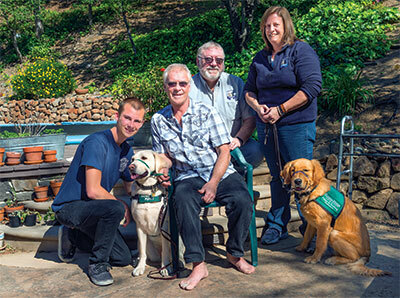 Mark Helgeson (center, seated) is surrounded by support for his dog training mission: his son, Caleb (left) and Serenade, along with Chris and Nora Salet and their dog, Summit. During his four-day recovery from hip replacement surgery at NorthBay VacaValley Hospital, Mark Helgeson of Vacaville had an unusual request. Doggone it, he wanted company—visitors of the furry, four-legged variety. And so, friend Nora Salet delivered, with four—count ’em—four approved guests well-heeled in minding their Ps and Qs. Therapy dog Elko (a lab) and service-dogs-in-training Summit (a golden retriever), and Hibachi and Serenade (both labs), trotted in to give Mark just the boost he needed—and charmed staff and other patients alike in the process. Of course, not all pets are allowed in the hospital. Therapy dogs, service dogs and service-dogs-in-training are the exceptions. However, Cynthia and her team have been known to coordinate a visit outside with a patient and a pet. People who connect with animals can benefit from hospital visits during recovery from surgery. For the service dogs, a visit to the hospital, or library or grocery store is all in a day’s work, explains Nora, who with her husband Chris, are leaders of the Solano County Puppy Raisers Club. The group includes about 16 local families (both raisers and puppy sitters) who are raising nine puppies to be guide dogs for the blind. Among them are Mark and his son Caleb, 17, who are raising Serenade. They hope she will graduate this summer (if she passes all her tests) and will be turned over to a new master to be his or her eyes. This is the first time Mark and his son have tried their hand at training. Caleb had been asking to do this since fifth-grade, when he had the chance to help a teacher with the training of a dog. Now a student at Buckingham Charter Magnet High, the timing was finally right. The family didn’t realize that Mark was going to need surgery, but it really didn’t cause any problems, says Mark. “Caleb has been able to take Serenade to school, and Nora has helped out by taking Serenade to her work at the Solano County Government Center a few days a week,” he explained, noting that he was “grounded” during his recovery. “The first week I kept her at home with me, but she was quite bored,” he says. He knows he’ll be sidelined from his job as a building contractor for about six weeks, during which time he’ll have to do a lot of therapy. Part of the responsibility in training is to socialize the dogs, making sure that they behave properly in all settings—from school to work to restaurants, and yes, even hospitals. Service dogs and service dogs-in-training are protected under the Americans with Disabilities Act to go anywhere a handler would—into stores, public transportation, restaurants—as long as the dog is clean and well-behaved. Therapy dogs do not have the same rights and are only allowed to enter areas when invited to visit. Service dogs are trained in different areas— some are guide dogs for the blind, such as Serenade and Summit. Others are trained to sense when seizures are about to occur for an epileptic, or sniff allergens that can be life-threatening for some people. In Serenade’s case, it’s important that the family teach her not only to be social, but to avoid games such as fetch, which could pull her away from a blind master. Caleb was happy to care for Serenade, walking her or taking her to school. Serenade isn’t the only dog in the Helgeson home. She joined Sadie, who Mark lovingly calls a mutt. And although Sadie will stay, Mark knows it’s going to be hard to say goodbye to Serenade when the time comes. She’ll be called up to the Guide Dogs for the Blind training center and headquarters in San Rafael for her final training, which, if she passes, includes a two-week session to live, work and bond with her new master. The Helgesons will be invited to attend her “graduation” and will officially turn the leash over at the ceremony. At that time, they’ll be given the opportunity to take a new puppy home. Caleb doesn’t think he’s going to have time to do it again. He’s working as a junior firefighter and also has a job at Gold’s Gym. And, in addition to school, he’s working on his Eagle Scout project.